Adams Golf has tried to reposition themselves and differentiate their equipment by appealing to the players who do not take themselves or the game too seriously. That is not to say they do not take their own equipment seriously and they produce some really great products that will suit a wide range of players. The Adams Golf "Blue" is no exception and it is a top quality driver that provides buckets of forgiveness, a really great launch, and a perfectly acceptable distance off the tee. 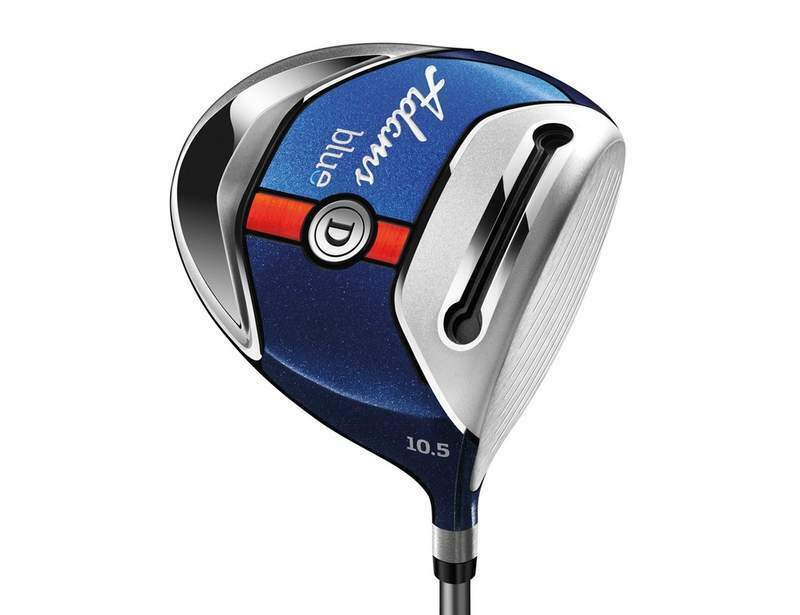 In this Adams Golf Blue driver review we’ll take a look at the club in more detail. Let’s jump right in. Parent company, TaylorMade make some of t﻿﻿﻿﻿he finest drivers money can buy so they are by no means strangers to technology and quality, they have just decided to take a different approach with the Adams Blue series and they have many very satisfied fans. While it will not appeal to the very top golfers, it is not designed for them but rather for the bulk of the market that sit just over a low, single digit handicap. The driver is uncomplicated, well priced, and performs exceptionally well. It is positioned a game improvem﻿﻿ent drive﻿﻿r that will help the average golfer get more air and accuracy with ease. Adams made use of three main technologies to create an uncomplicated, fast, and high launching driver most players will benefit from. They combined their Velocity Slot Technology with a SlimTech Shaft and a Center of Gravity (CG) that is low and back. These technologies work together to produce what they call their Easy Launch System which does exactly as the name suggests- make it easy to get great launch. Given that this is one of the most common driving challenges faced by many players, this design will be welcomed by golfers from beginners to the more advanced. We will discuss the shaft in more detail a bit later. Let’s start with the weighting. Like many designers targeting the non-professional golfer, Adams have made sure the weight of the 460cc titanium head is positioned towards the lower, backend of the head. This immediately enhances the launch. The bottom line is, the Easy Launch System works, and it works well. Another great feature is the Velocity Slot Technology, something that sets Adams drivers apart. This slot sits on the sole of the head and it’s the biggest they have made so far. The design enhances the face flex over the greater area of the face giving you greater ball speeds even when the ball is not struck dead center. Many golfers who used the Adams driver with this technology are extremely grateful for the speed and forgiveness it provides. Adams has also kept the weight of the Blue driver down which will further help to improve swing speed and distance. These features alone make it suitable for a wide range of golfers from the beginner to the more advanced golfer who want an easy launch every time with good distance and outstanding forgiveness. The drivers are designed with a subtle draw bias so the serial slicers will find some relief there and enjoy greater accuracy and distance. There are three loft angles to choose from. The shaft is the third aspect that contributes to the trio of technologies that make up their Easy Launch System. Adams has incorporated a SlimTech shaft that has a low kick point. It is a 55g Aldila Slimtech graphite with a tip that, at 0.76mm is 0.03 inches narrower than the average. This refinement might sound small but the additional kick at impact will add a bit of speed and enhance the launch, giving you a greater trajectory and better carry. At 45.5 inches, it is easy to control and makes for a smooth, effortless swing that gets results. There is a choice of stiff, regular, or senior shafts, depending on your swing speed. With much of the focus on the launch and forgiveness, distance is good but not spectacular. Consistent, accurate drivers might be disappointed by this, but the average golfer has much more to gain from the strengths and will be happily sitting in a decent position if perhaps a few yards back from other players. The slight draw bias and closed face will go a long way to help those who tend to slice often and will also help reduce fades. If you want to find more fairways over your round, the Adams Golf Blue might just be the driver you have been looking for. Those who like to fiddle with weights and hosel settings will be disappointed but for most players, the club is well designed and set up to do what it promises to do. Impact sound can be a very subjective preference. Some found it to have a pitch that was unpleasantly high while others found it to be a solid pleasing sound. The tactile and audio feedback was good with players getting a great idea of where they struck the ball. Most people found the driver to be a good compromise between style and sophistication, having a bit of fun without being over the top. The pleasantly rounded head is dark or navy blue with a grooved, brushed steel face. There is a darker blue to provide an alignment aid. The logo is subtle. Retro headcovers seem to be very popular and Adams decided to do the same with a stylish headcover although some people found it a tad bulky. As bonded drivers go, the Adams Blue has a lot to offer many golfers, particularly the new guys who battle to get consistent launches and need the maximum forgiveness a driver can offer. Not having adjustability allows you to get used to the driver and concentrate on getting the ball up in the air and travelling a fair distance down the fairway, staying pretty much on course. The somewhat closed face will help those with a tendency to fade or slice. It is a competent game improver that will be of great benefit to many golfers.